(Suburban Foragers) In a major catastrophe, such as Sandy, knowing about the edible and medicinal plants that grow in your area could spell the difference between life and death. Walking around the streets of my neighborhood in the days following the uninvited visit from Sandy, I was surprised at how little damage had been done. The streets were littered with branches and debris that had blown around, but all in all we had escaped relatively unscathed. There were one or two big branches that had fallen (missing all the power lines), and half a tree that came down between my neighbor’s cars without leaving a scratch on either. Neighboring streets proved to be similar, with a few downed trees and lots of leaf litter. During one outing, I came across my favorite ginkgo tree. The last time I had visited it, I checked the branches and decided there wasn’t much fruit remaining, so I wasn’t expect to find many berries lying around after the storm. Boy, was I wrong! The ground beneath the tree was strewn with hundreds of berries. I stopped and filled a bag, hardly making a dent in the fallen fruit. I’ve been back several times since, and have gathered enough to fill two 5 quart pails. 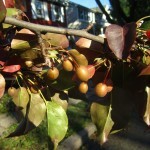 On my way down to the river to survey the storm damage, I passed one of my favorite crab apple trees. Here I paused long enough to fill my pockets with fallen fruit which I decided to use to make some pectin for jam making. 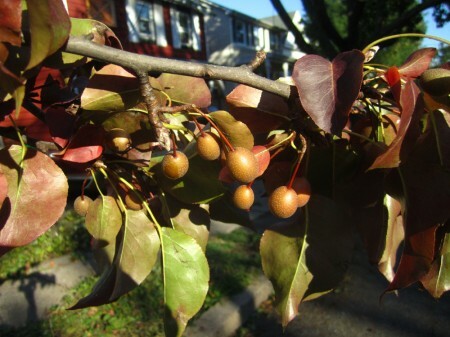 Later that day, while walking my dogs, I noticed the Bradford pear trees that lined our street had also dropped a lot of fruit. They were planted, mainly because of their beautiful white blossoms in the spring. 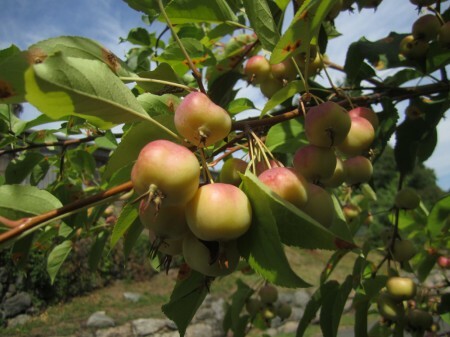 However, they grow a small, hard fruit, about the size of a small cherry that remains intact for much of the year. I first discovered them after Hurricane Irene, when a branch fell outside our house. I had tried cooking them, but they proved too tannic to really enjoy. However, this time I was determined to make them palatable. What if the storm had been so serious that these were all there was to eat? 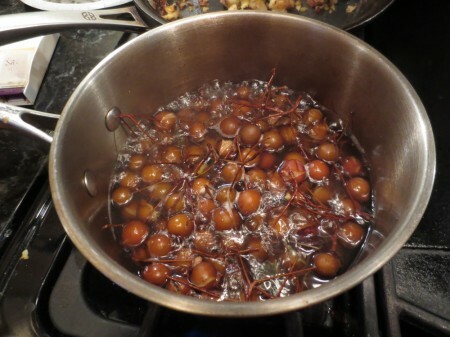 I began by putting them into a saucepan (leaving the stems attached, as they are very difficult to remove). I covered them with water and brought them to a boil. Once they had softened up and were splitting apart, I took a potato masher and turned them to pulp. Then, using a wooden spoon I pushed the pulp through a sieve, leaving behind the skins and stems. The resulting sauce was quite tart and tannic, but the addition of some sugar helped to make it more eatable. I have to admit that as a sauce, it left much to be desired, but I figured it would be good to use as a thickener for more runny sauces. 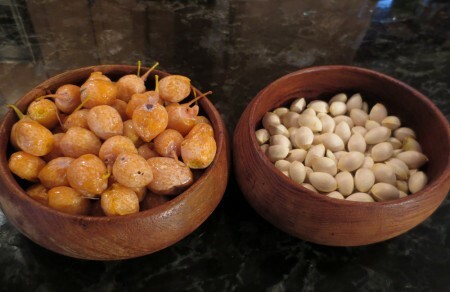 I have some autumn olives in my freezer that will make a tasty, but rather thin sauce. I’ll probably freeze my pear sauce and use it to thicken the autumn olive sauce that I’ll make during the Holiday season. In the aftermath of Sandy, there are edible fruit laying all around the ground. But not just fallen fruit can be used as food. At this time of year there are plenty of fresh greens available. These include dandelion, galinsoga, bittercress, chickweed, purple deadnettle, garlic mustard, stinging nettles and numerous mushrooms, not to mention barberries, rose hips and edible roots. There are also a number of useful medicinal plants around. I have seen plantain (healing), yarrow (numbs wounds, stops bleeding), mugwort (soothes aches and cramps) and comfrey (for bruises and fractures) as well as numerous trees whose inner bark can be used for everything from cough remedies to pain killers. 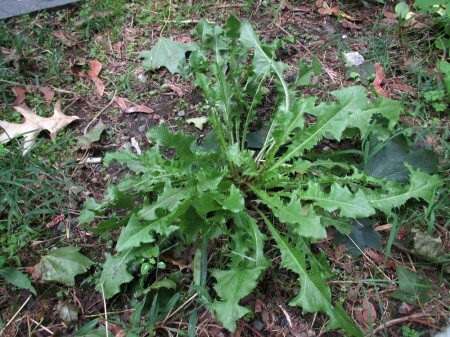 Dandelion (basal rosette) the greens are great sauteed or steamed. The roots are also great for dandelion coffee or as a tea. 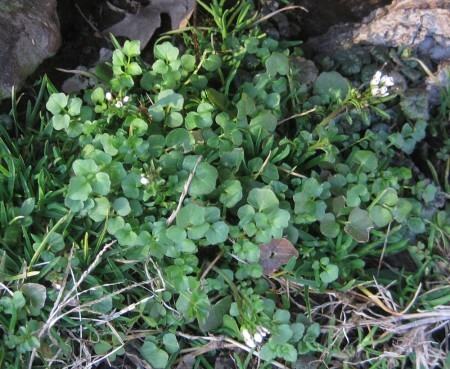 Bittercress is delicious raw in salad and abundant through the cold season.